Every day up and down Britain alpaca and visitors to the countryside can be seen gazing inquisitively at each other over hedges. The alpaca have come from high in the mountains of South America, and they have settled in well to their new life. Herds are flourishing, and the farmers who look after them are happy too. Demand for alpaca products continues to grow; not only is alpaca wool soft and light, but it is exceptionally warm and hard-wearing too. 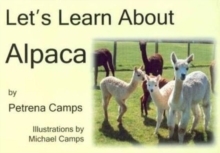 Let's Learn About Alpaca is an introduction to these lovable, affectionate, gentle animals.